WARNING: DESCRIPTION CONTAINS SPOILERS IF YOU HAVEN'T READ ANGELOLOGY! Summary: A New York Times bestseller and global sensation, Angelology unfurled a brilliant tapestry of myth and biblical lore on our present-day world and plunged two star-crossed heroes into an ancient battle against mankind’s greatest enemy: the fatally attractive angel-human hybrids known as the Nephilim. With Angelopolis, the conflict deepens into an inferno of danger and passion unbound. 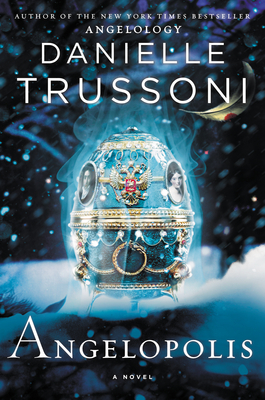 Just last week, I finally got around to reading ANGELOLOGY by Danielle Trussoni, and I absolutely loved it. You can read my review here! I waited a few days and started the second book in the series ANGELOPOLIS, and I admit that my expectations were pretty high. Overall, I do think ANGELOPOLIS lived up to what I wanted from this novel -- I was still fascinated by the story; but I still don't think I enjoyed it quite as much as ANGELOLOGY. ANGELOPOLIS picks up where ANGELOLOGY left off -- only ten years later. I hesitate to go into too much detail about what happens in this novel because I don't want to spoil anything for those of you who haven't started this series yet. Having said that, the publisher's description that I used at the beginning of this review definitely has a few spoilers! So read it at your own risk! I had many of the same reactions to ANGELOPOLIS as I did ANGELOLOGY, and that probably won't come as a big surprise to those of you who have read both novels. As a result, this review might sound somewhat repetitive to the one I wrote last week. Once again, I am extremely impressed with Ms. Trussoni's storytelling abilities, as well as her creativity. I can't not get over how unique this story is and I love how she managed to blend mythology with real life history and biblical lore. It truly is impressive just how well this novel comes together. In addition, I loved the thriller aspects of the story. The intrigue and mystery, along with surprise,s are so entertaining, and I honestly had a hard time putting this book down. While I couldn't read it in one or two sittings because "real life" got in the way, I did find that I read it in pretty big chunks. The story moves extremely fast between the various story lines, and I was extremely curious to see what happened to (and between) the characters. I also loved how well the various secrets that were revealed and how they played such an essential role in the story. Truly, this novel is very smart; and the author certainly has conducted a tremendous amount of research as background for her books. I do think ANGELOPOLIS would make an interesting book club pick, and it probably does work as a standalone book; however, I recommend reading the books in order to appreciate them more. There are some pretty heavy themes surrounding faith and good vs. evil that might be fun to discuss. In addition, I think the characters' actions and motivations are fascinating -- especially as they relate to ethics and honestly. Some additional themes you might want to talk about include love, obligation, secrets,parent/child relationships, and betrayal. I enjoyed ANGEOLOPOLIS a great deal and I highly recommend this series to fans of myths and thrillers. Make sure you check out my great giveaway for copies of ANGELOLOGY and ANGELOPOLIS! I have the audio, I just need to load it and get to it. I guess I am dragging my feet because I am expecting that it won't be as amazing as the first. There were a couple of things about the ending that surprised me too -- an not necessarily in a good way. Regardless, I enjoyed the book and I'm looking forward to the next. Wow, so many people are loving this series. I have a feeling my sister would love it but I'm just not sure it's for me. Totally totally agree with you about the PUBLISHER putting in spoilers - for BOTH books!